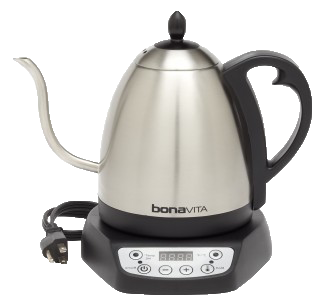 This full-featured Gooseneck Electric Kettle heats water precisely and quickly. The gooseneck design gives you pinpoint control of your pour and the count-up timer makes it easy to keep track of your brewing process. Adjustable in one degree increments 140Â°-212Â°F, 1000 watts for quick heating, 60-minute heat-and-hold and real-time temperature display.